These Victorian style boots are the perfect costume accessory for any womens renaissance or pirate costume. 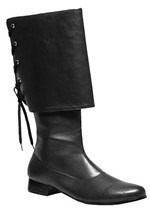 These knee high boots come in faux leather with a fabric lining. The boots have a pointed toe and a zipper on the side while a lace weaves from the ankle to the top of the shoe. These boots are the perfect way to display your renaissance or pirate dress.